Welcome to The Norma Stark Memory Garden and Labyrinth. 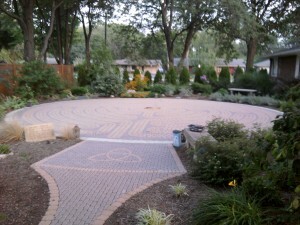 The Labyrinth and Garden is designed to be a sanctuary for peace, prayer, meditation, and healing. It is open to the public and is for everyone to enjoy and use. The labyrinth was designed by John Ridder of PAX works, Indianapolis, Indiana. It is a 9-circuit adaptation of the Chartres Labyrinth, found in the cathedral at Chartres, France dating back to the year 1202 A.D. The Norma Stark Memory Garden and Labyrinth was created in memory of Norma’s parents, Norman and Anna Belle Swaisgood, who passed away October 13, 2005 and April 23, 2006, respectively. The Norma Stark Memory Garden and Labyrinth is open to the public from dawn to dusk, all year around. It is located at 345 W. South Boundary, Perrysburg, OH 43551. For directions please click here. Come and enjoy this place. Use it as a sanctuary to find yourself, your peace, and to remember Norma. The latest acquisition to the Garden is a new fountain at the entrance. 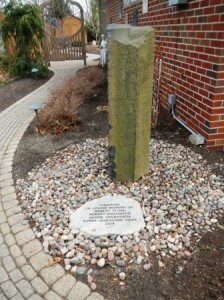 It was designed and crafted by Calvin Babich, a local stone artist. Along with the fountain there is a memorial plaque donated by Sue Wynn, one of our Board members. Donate to the Stark Memory Garden Foundation through AmazonSmile. When you are thinking of ordering from Amazon, go to AmazonSmile first, search for Stark Memory Garden Foundation and select our foundation. The Amazon Smile Foundation will donate 0.5% of the purchase price to the Stark Memory Garden Foundation. Groups wanting to visit the garden and labyrinth please contact Alice Buehrle at 419-410-2496.